Celebrating the love you have toward one another is a wonderful feeling. Make those words stay forever with our Anniversary Personalized Picture Frames that features a lovely engraved poem along with your loving sentiments. This makes a special anniversary gift, Valentine’s Day or Sweetest Day gift. 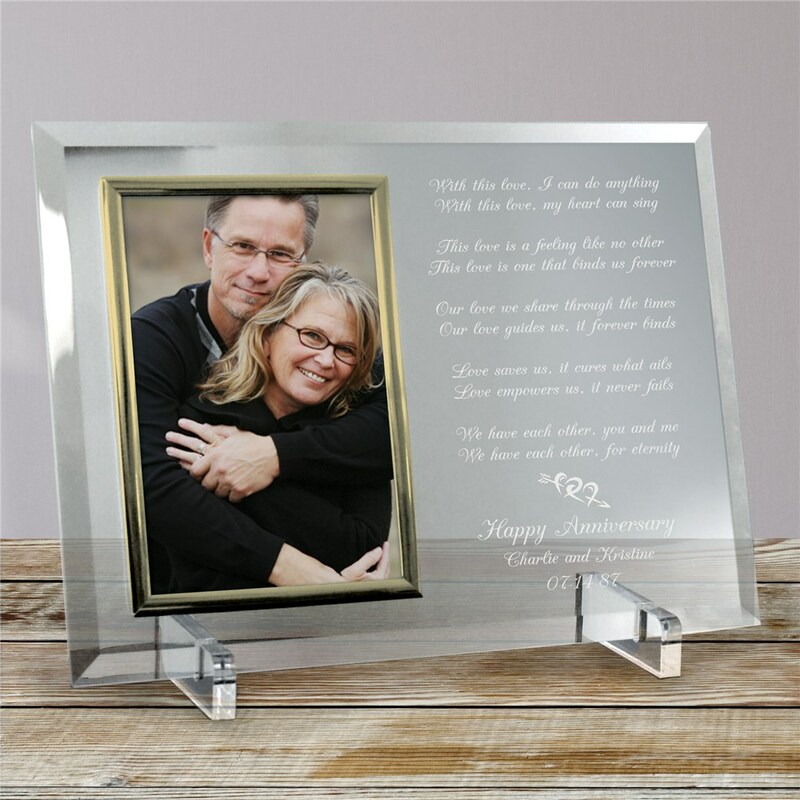 Our Anniversary Beveled Customized Picture Frames are a heavy-weight glass with beveled edges on all sides, accented with golden brass frame trim. Frame measures 8" x 11" and holds your 4" x 6" photo; includes clear easel legs for top display. Includes FREE Personalization! Personalize your Anniversary Beveled Glass Picture Frame with any one line message (ie: Happy Anniversary), the couples names and date. Choose Gold Trim or Silver Trim Frame. I like this prduct, but the etching for the poem was a bit lighter than appreared online. you have to look closely or in the right light to reach the words. the frame iteself is terrific. Showcase your favorite photograph of the Anniversary Couple in their own Personalized Wedding Anniversary Picture Frame. More than a simple picture frame, this beautifully Personalized Wedding Anniversary Frame makes a wonderful addition in your home. We make ordinary wedding frames, extraordinary with personalized style and grace. Shop GiftsForYouNow.com for all your Personalized Wedding Frames and save every day.